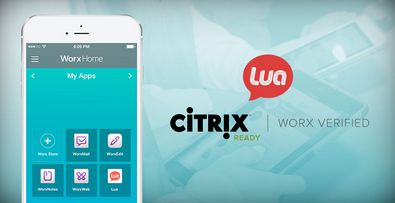 Lua, the leading enterprise mobile messaging solution, today announced that it has been verified as Citrix Ready®. Lua completed a rigorous verification process to ensure compatibility with Citrix, enabling organizations running Citrix XenMobile Enterprise Mobility Management (EMM) to easily administer Lua as a managed app across the enterprise. With Lua, enterprise users can harness the power of texting for work, and benefit from an empowered, secure mobile workforce with enhanced BYOD capabilities. Lua is now featured in the Citrix Ready Marketplace. “We are pleased to have Lua join the Citrix Ready program,” said Chris Fleck, Vice President of Mobility Solutions at Citrix. “Adding Lua’s instant and secure messaging to XenMobile will empower the mobile productivity revolution happening today, inside every successful business." The Citrix Ready program makes it easy for customers to identify complementary products and solutions that can enhance Citrix environments. Customers can have confidence in the fact that Lua has successfully passed a series of stringent tests and can be trusted to work effectively with XenMobile. Additionally, through XenMobile, administrators can centrally manage Lua’s app permissions in adherence to their organization’s specific security policies, ensuring that the increased operational efficiencies that Lua offers mobile workers does not come at the cost of network security. This is the latest in a series of developments around Lua’s close partnership with Citrix. Lua previously announced its integration with Citrix ShareFile, the secure enterprise file sharing and storage solution. Lua will showcase this solution with Citrix at Citrix Synergy in Orlando, FL on May 12-14 as a special exhibitor in the Enterprise Mobility Management Pavilion. Feller, Austin Lane - Chief Product Officer and Ryan Snell - Vice President of Sales will be available to meet at booth 808.